General English is our most popular course for Young Learners. With 15 hours tuition per week children aged between 8-17 can quickly start to improve their English. We’ll develop each child’s practical communication skills, with special emphasis on speaking, pronunciation and listening. Our friendly teachers use a variety of teaching methods to make sure that they get plenty of practice. We want them to enjoy learning English as much as we enjoy teaching it! And we want the English that we teach you in our classes to be relevant and useful outside the classroom. 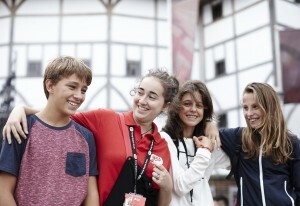 Our London Summer School is situated near the British Museum in a Georgian building and is ideal for young learners Students can enjoy the back garden during breaks, borrow books from the library and have free Wi-Fi. Where as in Dublin our young learners are just a few minutes walk from our main school on Jervis Street in our modern and high-spec campus. Our classrooms are all equipped with free Wi-Fi, space to display students’ work and many also come equipped with interactive white boards. Our Classes are suitable for all levels from beginner to advanced and we make sure that students are placed in classes according to their age and abilities. We invite all our students to do a level test before their arrival so that students can enjoy their English classes from day one! At the end of the course all students will receive a YES Certificate and an End of Course Report to show mum, dad and their teacher back home how well they did. London and Dublin – Start any Monday from 17th June 2019, last Friday of the summer is 16th August 2019.